Flying a kite with Daddy. 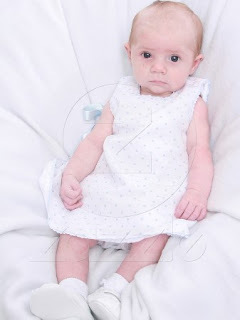 Abby's pictures are a little more posed. She loves to lay on the floor and laugh out loud. Here are a few pictures of her. She is growing and changing. Abby loves her bath, so I thought that I would take a few shots of her after and during bath time. She is 9 weeks old now. At her 2 month appointment she weighted 11 lb and 3 oz and was 24 inches long. She is a very long baby... Things have slowed down a little and Abby and I are relaxing some and enjoying our last few weeks before I go back to work..
A serious during the bath shot..
We had a great Easter Weekend. Carter and Abby had a great time. She still is a great sleeper but loves to lay on the floor and just kick her legs around. I am also proud of my little girl in that she slept through the night 11-6. What a big girl.. We had an Easter egg hunt at church on Saturday, colored Easter eggs on Saturday evening, went to church on Sunday and then had Patrick's family over on Sunday evening for dinner and an Easter egg hunt. Here are a few pictures to enjoy. Carter after the Easter Egg Hunt at our church. Carter, Abby and Daddy. So into looking for the eggs. Mommy and Carter coloring Easter Eggs. Easter morning with their Easter Baskets. Abby learning about the word around her. Cousins, Carter and Ian waiting to look for eggs. We have a great group of moms and little boys that met at Gymboree classes. We often get together for various play dates. 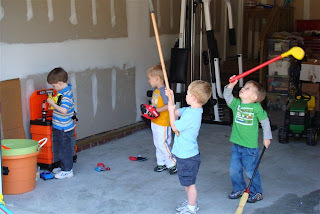 Awhile back, Carter said that he wanted his friends to come over. 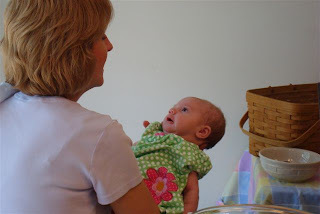 What better time than while I am on maternity leave and have more flexibility. So today we had an Easter egg hunt and the boys played outside and inside and had a great time. Their were 7 boys all 3 1/2 years old. Some of them also have younger siblings, mostly boys too. Here are a few pictures of our day today. Ryan on the John Deere Tractor. His favorite. 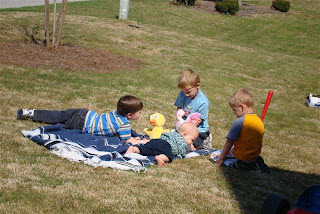 Carter, Ryan and Caleb entertaining Nolan on the blanket. Brothers, Justin and Brandon. These boys look a little dangerous, but they were having a great time. Pierce loved to do landscaping with the dump truck and pine straw. Carter collecting Easter eggs. Bridget and Caleb. Cathy and Ryan Tanya and her boys, Pierce and Nolan. Robin with her boys, Caleb and Coleman. Abby slept most of the time but made a brief appearance. 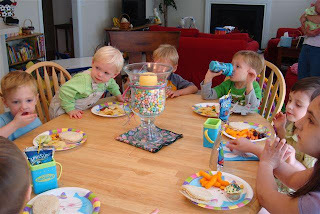 All the kids gathered around the table. Pretty impressive. Two of the moms from these playgroups have moved away. It just so happens that they had the only girls in the bunch. We miss you Macy and Savannah. Enjoy the pictures. Just wanted to give everyone a weekly update. Things are still great and Abby is now "waking up". 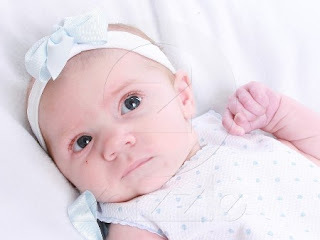 She is much more alert and looking around and interacting. It is so fun. Carter still loves his big brother status. The other day in the car there was a loud noise. Carter said, "Abby, don't be scared about the loud noise, it was just a motorcycle going by." Already, so sweet and protective. Just wait until she takes his toys..... Here is Abby in some of her Easter attire. I love her in pink. Brother and sister posed at an Easter Egg Hunt. Waiting to look for eggs. We went to Myrtle Beach for the day to visit Jenn and Andy Hays and their kids, Nicole and Grant. I went to PT school with Jenn and they were in South Carolina for Spring Break so we got together. These pictures were taken at the Ripley's Aquarium. Abby decked out in a new dress from my cousins, Becky (Boo) and Matt. It looks so cute on her. Have a great week. Hopefully, I will have more pictures later of Easter activities.